So you know the story: nightmare-demon serial killer kills victims in their sleep. We're talking Freddy Krueger of course! With his red and green sweater, terrible burn scars, and brown fedora, this Nightmare on Elm Street villain is notorious. But of course, we would be sorely slacking if we didn't mention his most iconic feature: his bladed hand. Sure, dream-hopping is pretty frightful, but we all know the terror of nails on the chalkboard. This is just nightmare fuel! Who knows what dreams you may have, but if they include Freddy, maybe take the fear in your own hand with this Freddy Supreme Edition Glove. This is a movie quality prop replica with a synthetic glove. The blades are about 7" long and actual metal, welded to the finger covers. That's right. This puppy could actually do some damage. It's not a toy and not recommended for children. 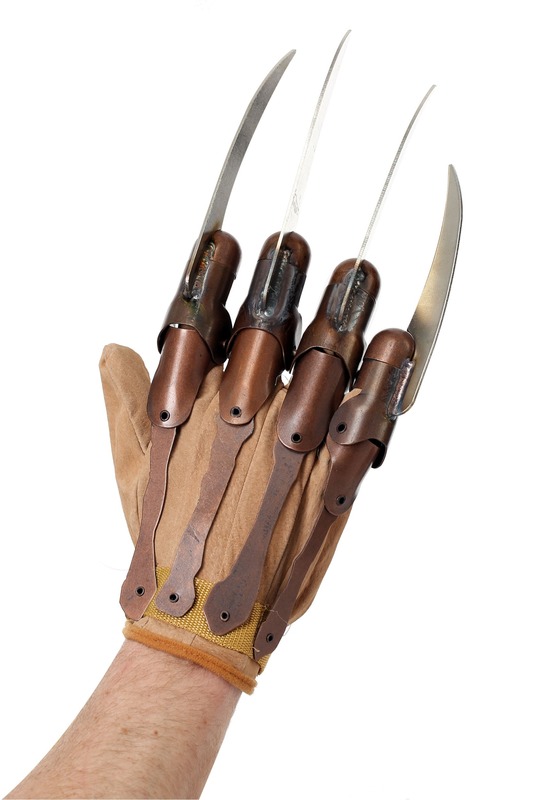 If, however, you are a die-hard fan, this may be the perfect Freddy hand for you. If you're a fan of Freddy, say the kind of fan that dresses up like him, has Nightmare memorabilia, or the avid watcher of his films, then this Freddy Supreme Edition Glove is for you. Feel the very real terror in your hand as you give into your worst nightmares.